I hope you have been visiting me for the complete Snowman Matching Game set! These sets, altogether, are too long to offer as freebies in my store, so aren't you the lucky ones to find them here! 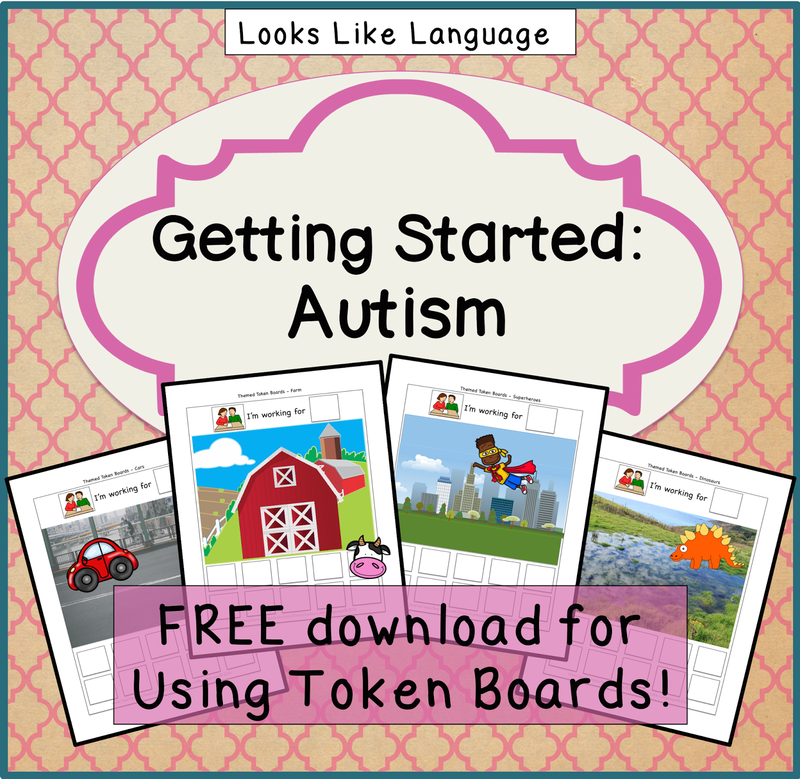 This week's free worksheets can also be made into a file folder activity! 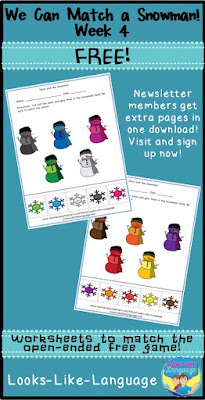 Just laminate the page tops on a file folder, with the snowflakes on the bottom as separate pieces, and you have an interactive file folder activity! Catch this week's freebie here! Happy winter! Did you see my autism tips on Instagram? 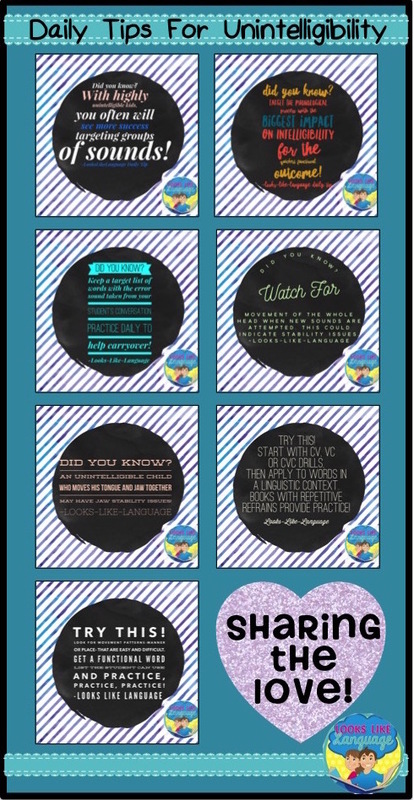 In case you didn't, I thought I would share a little more information about each tip here with you! If you don't yet follow me on IG, just search @lookslikelanguage. Easy! See you there! 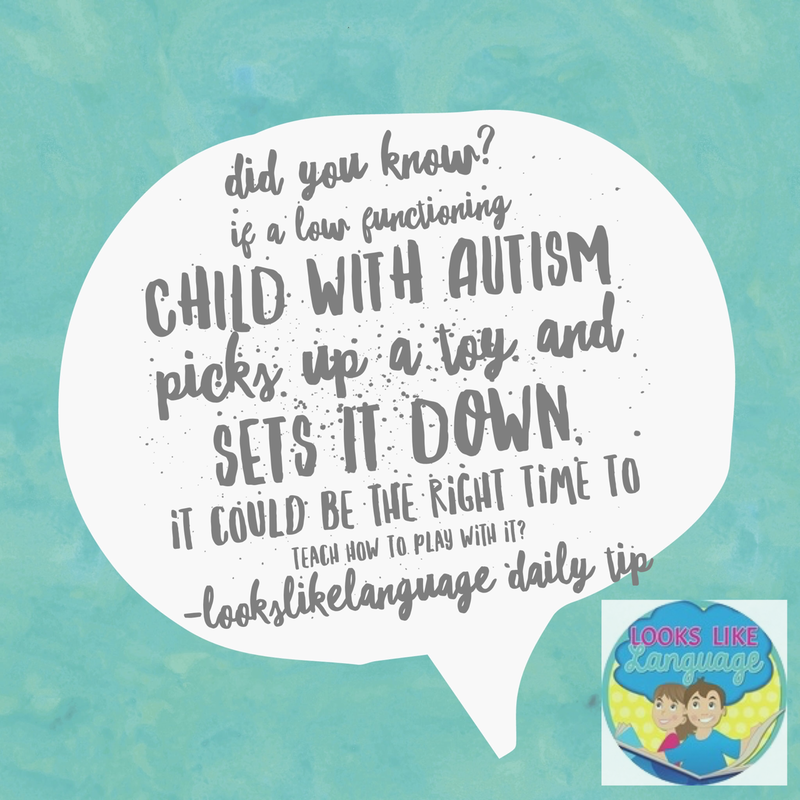 This week's tips have information I learned while working with low functioning students with autism at an ABA school. I don't really know how much background you get in college now regarding autism, but there was nothing back in the day when I went to school. NADA. So, everything I know has come from a combination of watching wonderful special education teachers, reading, taking many inservice courses and practical experience. I thought I'd share some of the important take-aways and aha moments I had. Maybe they will be new to you and help you with a student you have. Maybe they will just remind you of what you already knew. But either way, I hope they help! In functional behavior analysis terms, what happened just prior is called the antecedent. 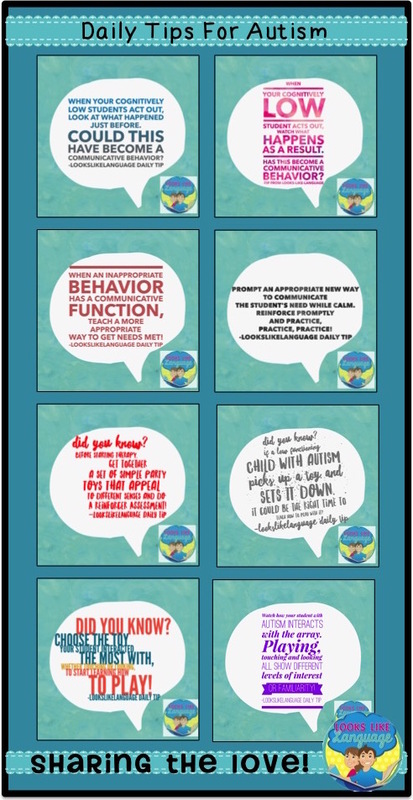 We look at the antecedent behavior for a variety of reasons, including for figuring out what triggered the inappropriate behavior and how to eliminate it. 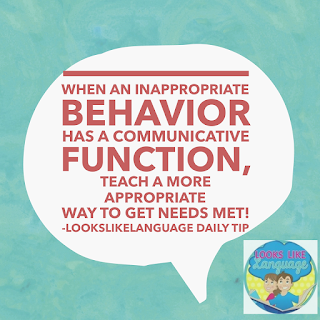 We need to work together as a team in the best interests of our students to reduce or eliminate inappropriate behaviors, but SLPs do have something to add from our specialty in communication. 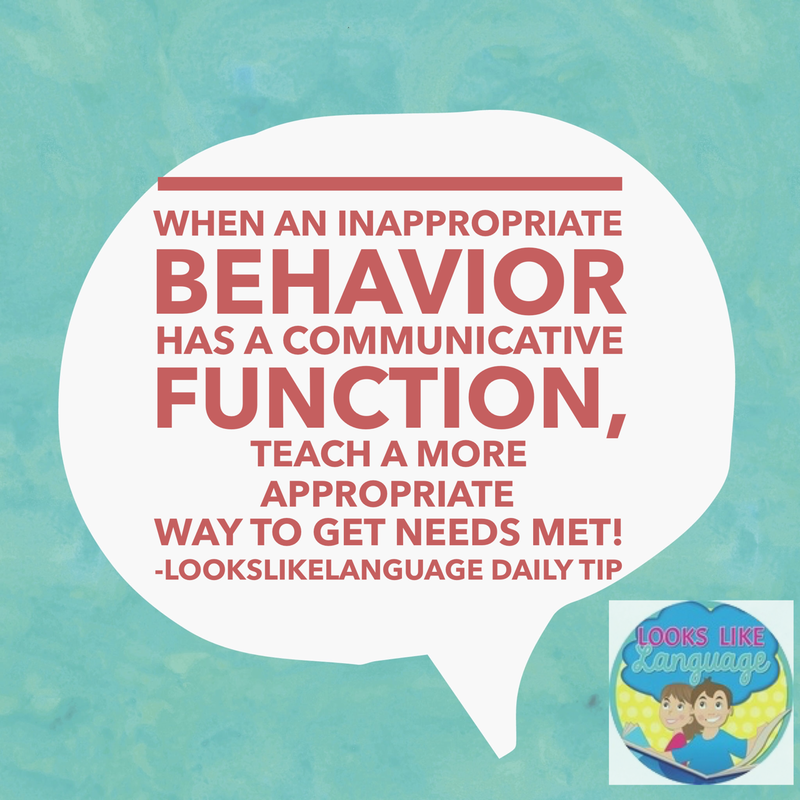 While the incorrect behavior needs to be stopped, if there is a communicative intent that the behavior serves, we need to replace that behavior with an appropriate way to get those needs met. 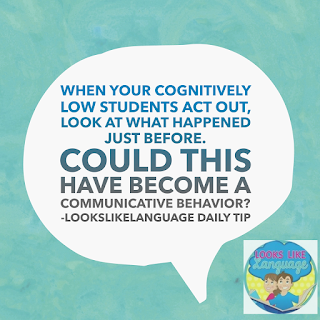 Looking carefully at what was going on prior to the behavior can possibly provide us with clues as to what the communicative intent may be. We also must consider what happened immediately after the behavior, called the consequence in functional behavioral analysis. 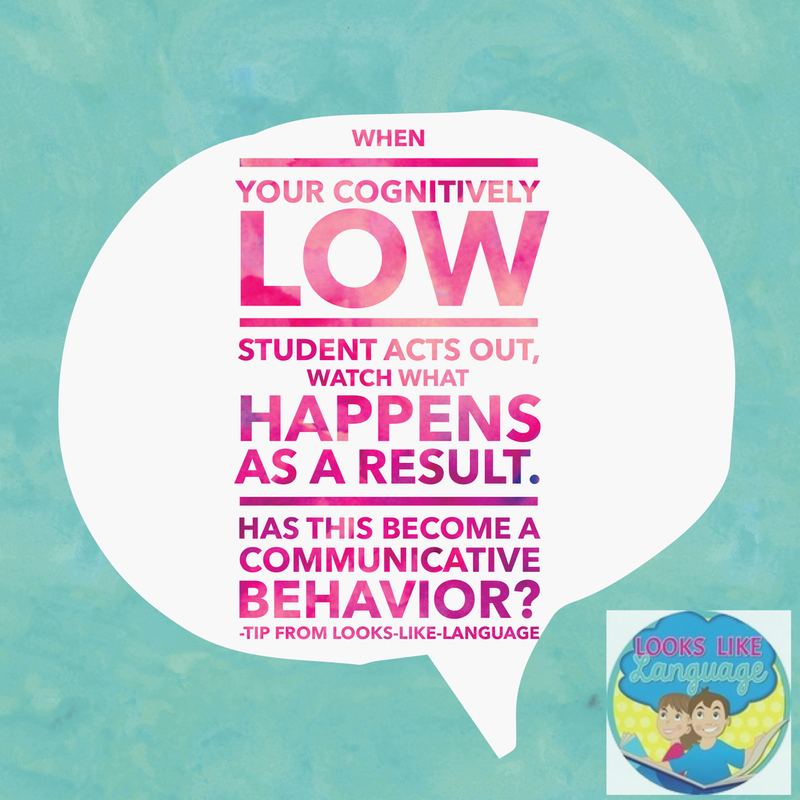 If our student gets something desirable after an inappropriate behavior, that behavior may actually become the way to request the desired item. 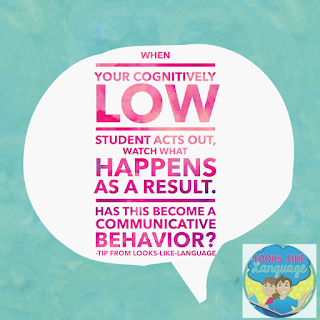 Again, the behavior needs to be corrected and we need to help the student learn an appropriate way to communicate. By the way, this always sounds easier on paper and in examples than it hardly ever is in real life, so I'm not even going to bother with an example here. Just keep working at it, readjusting your plan, until there is progress! It is the most important thing you can do! Students never learn while they are upset! 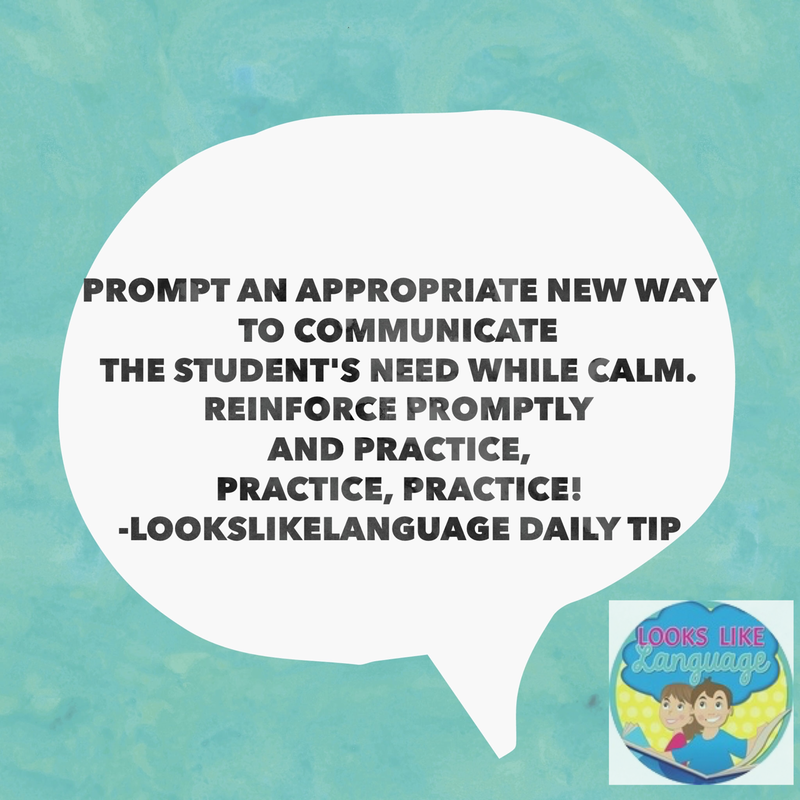 After you have a hypothesis about the communicative function, work on setting up situations to give the student as many trials as possible to practice the replacement communicative behavior while calm. Work with the team to follow the behavioral program while you are teaching the new communication skill. The inappropriate method of communicating did not develop overnight, and the new way won't be learned that quickly either. Careful data can help you tell if you are moving in a positive direction and keep your motivation levels up. 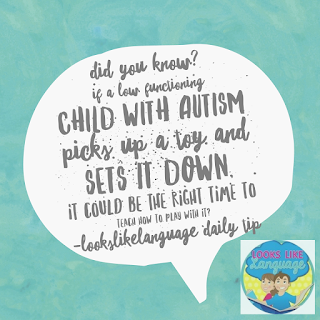 In my experience, children who are cognitively low functioning with autism usually have some problems with sensory integration. 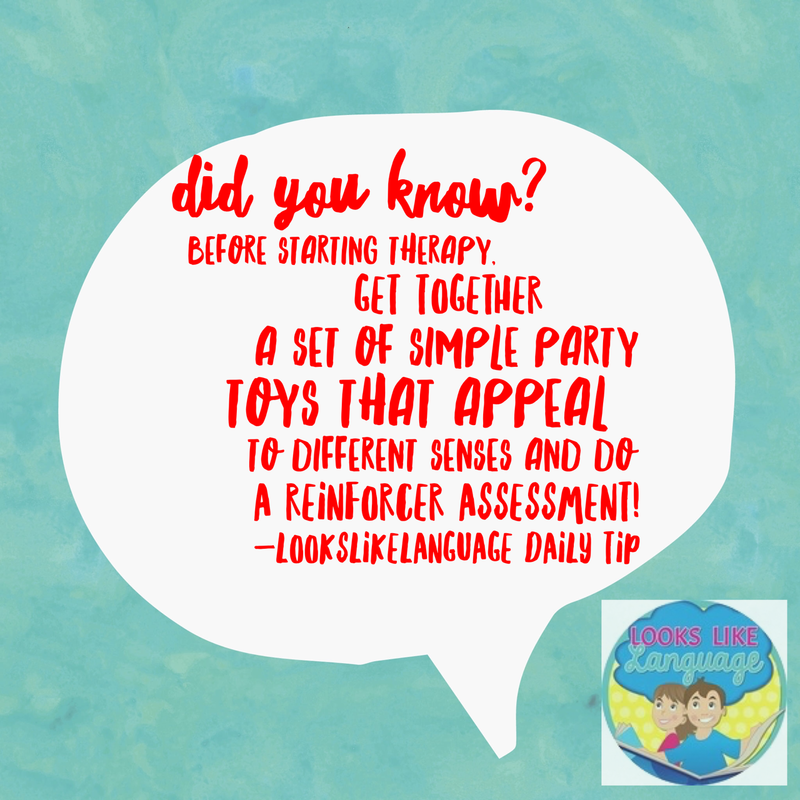 They will have some sensory modalities that they crave- toys and activities that fall in this category can be great for reinforcers and for breaks. They also have sensory problems that inhibit them from being able to handle a variety of activities. The child who is sensitive to noises is a prime example. You might see him covering his ears when it doesn't seem particularly loud to you, and he may not even be able to function during a fire drill. 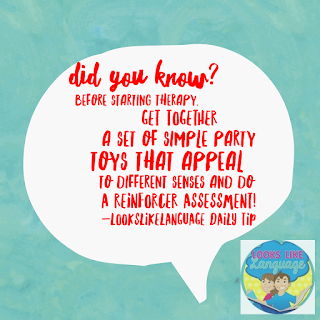 Getting an array of sensory toys will help you determine this pretty quickly, as well as giving you important information to use in planning therapy activities. My students had a lot of self stimulatory behaviors and very few to no actual play skills. They lacked the knowledge of what to do with the objects around my room and tended to use them as an extension of their favorite stimulatory activity. I found that if my students engaged with objects or traditional toys in any way at all, from looking or touching briefly to actually picking it up and interacting (inappropriately) with it, it meant they were interested. I started with the toy that got the most interest and matched their preferred sensory modality to teach them how to play. When skills are achieved with one type of toy, expand it to a similar toy! Click here to read more about teaching play. 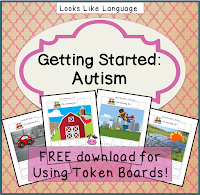 If you'd like a little more help, click here to check out my free Getting Started with Autism Guide! Don't miss out on this helpful free guide! 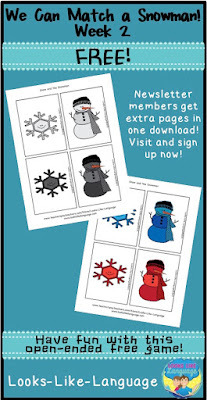 How much fun have your students been having with my free snowman matching game? Now, there's a treat for you! This week, I'm providing worksheets that will make homework fun! Download it here. See you next week for the last part of the set! Hi friends! Does this time of year get busy for you? I have tons of paperwork due, so I thought this was a good time to remind you that I am part of a collaborative blog! Have you ever visited Speech Spotlight? I just wrote a post that published yesterday! It is on my theme of managing mixed groups in therapy, but with a twist on taking data. If you'd like a few more ideas on this topic, you can read about it here. I've been sitting at my computer so long this week, I am starting to get a back ache! 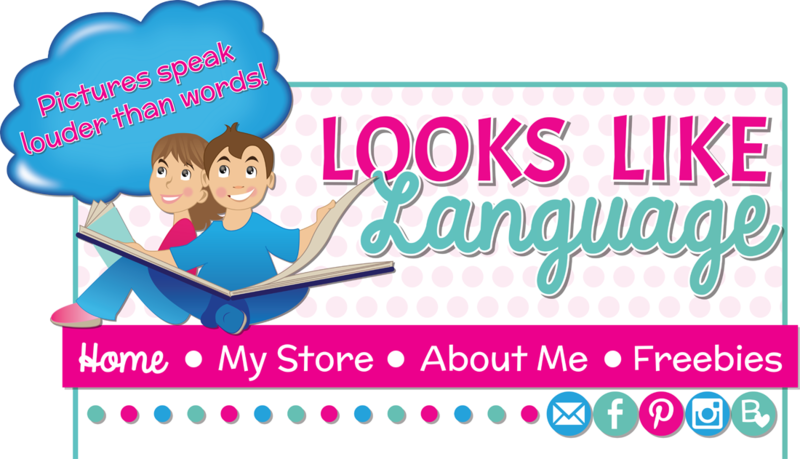 So, pop on over to Speech Spotlight for this week's post! I definitely have to start using one of the apps that will remind me to get up and move every so often! Do you have one that you have tried? Of course, an app that would do my paperwork for me instead would be sooooo wonderful! Till next week- stay warm! 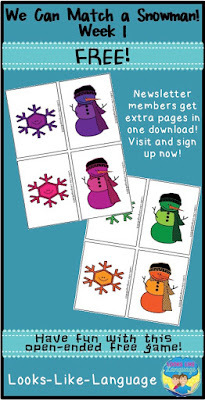 I hope you are staying warm inside and having fun with my free snowman matching game! This week, I'm giving you more cards for the open ended game. Newsletter members, be sure to check your email for the link to the complete set and extra pages! You can get the second set of game cards here. I hope you'll stop by next week for matching worksheets! 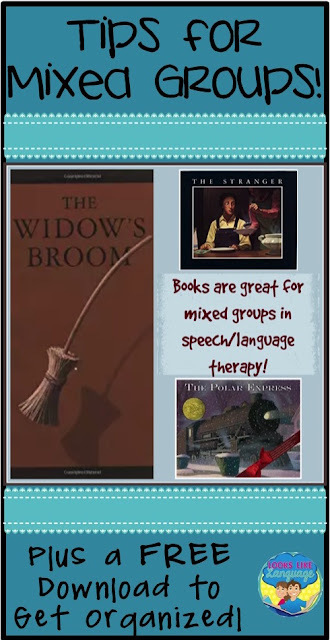 Books Make Mixed Group Therapy Easy! Tips and a Freebie! One of the common problems that SLPs have is in figuring out how to best manage the needs of mixed groups in therapy. 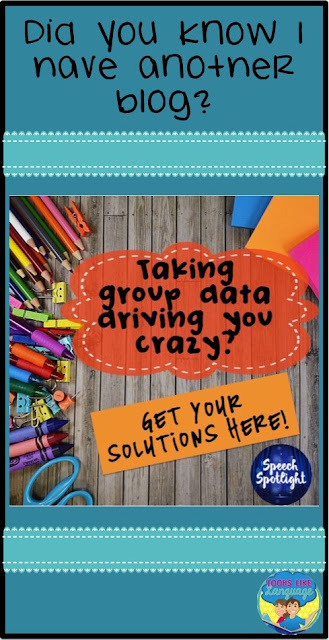 If you are just joining me in this series, you will want to check out this post about using games as the cohesive element for mixed groups since it has a freebie download for taking group data. The second post in this series gives tips for figuring out ways to pair up goals in activities for a smoother flow. My favorite way to make mixed groups work is by centering therapy around a great book! When I worked in preschool, it was easy to find a book that coordinated with the theme (usually seasonal) that the teacher was using in the classroom. Now that I am in middle school, with lower functioning kids, it is not quite as easy. I’ve tried using classroom books, but there’s too much my students don’t understand and the pace is too fast for therapy twice a week to keep up. This year, I’ve been using books by Chris Van Allsburg and my students have loved them! The plot is in depth enough to address multiple goals, the books are short enough to do in a few sessions, and the pictures are fantastic! They are beautifully drawn and not babyish, so the books work great for older kids. To get started with a new book, this is how I organize myself. Read through the book and figure out where I can take breaks. With simple sequential narratives and younger attention spans, that is the beginning, middle and end of the story plot. With longer books, like the ones I am using this year, I divide them up into complete episodes, if it is possible. Starting with my most mixed group, or my most behaviorally difficult group, I fill in my organizer with the group goals and think about how I can elicit the speech/language targets from each student. 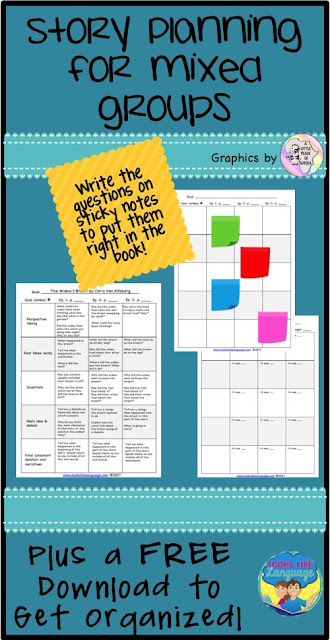 I write a set of questions I can ask at various points in the story section to get each student participating at short intervals of the story. 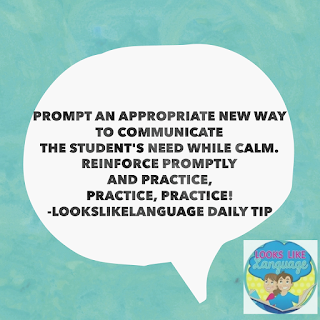 This is a helpful strategy to keep students with short attention spans, poor working memory, or processing problems engaged. It is also helpful for tired SLP overload! Articulation goals are the easiest: Just identify the words, phrases or sentences in the section that you want your student to read. If there aren’t enough, make a question list that will elicit those words again. Question goals: I have had great success with pairing questions with story grammar element symbols. The visual cue really helps my students spend less time processing the question, so they have a chance to look back in the text to find the answer. Grammar goals: Figure out sentences that these students can retell with their target structures, pictures that they can describe in a sentence with their targets, or questions they can ask/answer to work on their goal. Sequence/story retell goals: Pause at sections for students to recap the story. When there are goals that I can’t fit into the actual story telling, I save some time to have an activity related to the book and that goal at the end of the session. To make it even easier, fill out this information on sticky notes! You can pull them off the FREE organizer and stick them right in the book on the page they match! 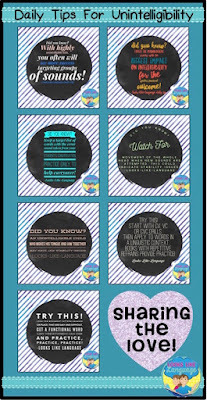 Click here to download the freebie and get your mixed group book themes started now. I promise, if you can figure out your most difficult group and your most common goals, the whole process will get so much easier as you continue to use the book throughout your week! In the winter, we can have fun inside talking about the outside! Be sure to come back every week this month to catch the whole set! If you need even more freebies, be sure to check out ClassroomFreebiesToo. I hope your new year is off to a good start! I'm doing my part to make it a good one with my free downloads. Remember, my newsletter members get additional pages all in one download! Get this week's game here. Wishing all of you a happy, healthy New Year full of wonderful times with your loved ones! 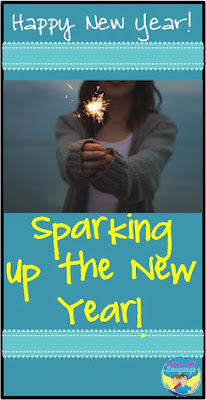 To get the new year started with a spark of fun, I decided to run a little contest here on my blog. Comment below with the answer to one of my questions to help me get my posts off to a great start in 2017. Up to five lucky readers will win a product of their choice ($5 or under) from my store if their comment is chosen! 1- What is it about the blogs that you really like that keeps you reading? 2- What areas of working as an SLP or special educator would you love to see more blog posts about? 3-What is the biggest problem you face regularly as an SLP or special educator? Comment below with an answer to one of these questions! Then check back in on Monday evening, January 2, 2017 to see if you are one of the lucky ones! 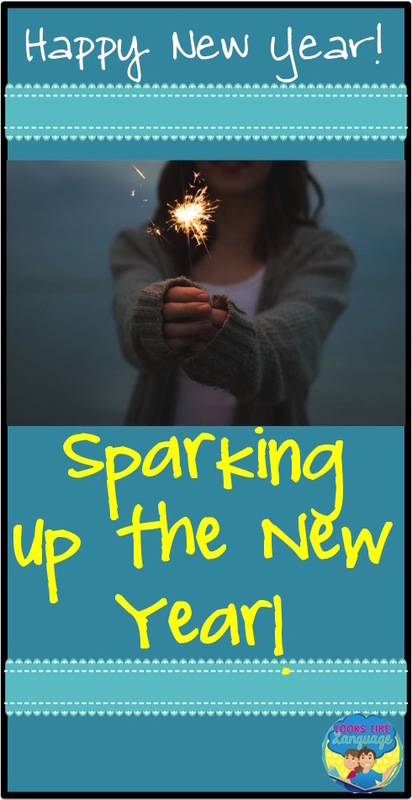 If you want to be sure to be a lucky one, search #spednewyear today to get some great dollar deals on TpT! Good luck and Happy New Year!